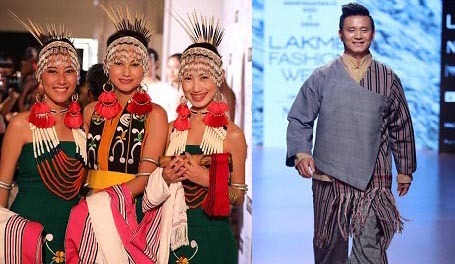 Designers Richana Khumanthem (Manipur), Daniel Syiem (Meghalaya), Sonam Dubal (Assam), Jenjum Gadi (Arunachal Pradesh), Karma Sonam (Sikkim) and Aratrik Dev Varman (Tripura) took part in the Sustainable Fashion Day at the Lakme Fashion Week on Thursday. 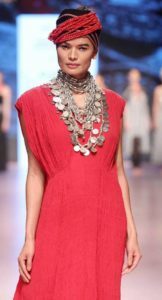 The Lakme Fashion Week will conclude on February 4. The designers from Northeast have raised concerns about a host of issues like government support, livelihood schemes, dearth of material etc. At the ‘Dialogue on NE India: Catalysing Sustainable Fashion in Collaboration with United Nations in India’, she lamented about the unavailability of raw material in Manipur. She said that dearth of material in the state needs to be addressed urgently. “Sericulture (silk farming) is a thriving industry in the State and for some reason cotton farming has been overlooked to a great extent,”. Daniel Syiem showcased his handwoven textiles collection by Ryndia silk artisans from Ri Bhoi district of Meghalaya. He said that most of the workers in Meghalaya are women, with a 96-year-old artisan being the oldest ‘who is passing the tradition to the younger generations through her craft’. The fabric, rich in thermal and medicinal properties, is called ahimsa silk as the material is extracted without causing pain to the worms. Sonam Dubal, represented Assam through his installation made of Eri silk, cotton weaves made by Sualkuchi community. He said the NE is the ‘bridge to the rest of Asia’ and therefore it was time the region was given attention “both as an ecological and a strategic treasure”. Jenjum Gadi’s collection showcased Loinloom artisans from Dimapur. He said the craft was practiced chiefly by women and it needs government support to thrive which can be possible through schemes for the State. “This doesn’t need much investment as women operate from their homes and it would mean growth in livelihood through tradition for them. They make around three-four thousand rupees per month,” Gadi added. Aratrik Dev Varman said bringing the work to the designers should be on their terms. He presented his line with Riahs textiles by Reang tribe from Tripura as the focus. The designer, who lives and works from his studio Tilla in Ahmedabad, said less emphasis needs to be given to crafting accessories such as bags, bookmarks, etc., as it takes away the essence of the Tripuri designs. Karma Sonam urged the government and UN to help designers to expand their business through streamlining of policies, material and support. Her label, Kuzu, specializes in the use of yak wool cotton.